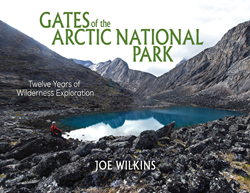 Releasing nationwide today, Gates of the Arctic National Park: Twelve Years of Wilderness Exploration (Brown Books Publishing Group) by Joe Wilkins, takes readers on an incredibly exciting and intimate journey through the northernmost and second largest national park in America. Located in the heart of the Brooks Range and far north of the Arctic Circle and indisputably the “toughest of the tough,” this park is often referred to as the “Blackbelt National Park.” This is an area of magnificent natural beauty; however, it also contains substantial dangers inherent in its rugged mountains, white-water rivers, wild animals, and challenging weather conditions. Drawing on the experience he accumulated during multiple decades of exploration in the Brooks Range, Wilkins’ informative book about this remote arctic mountainous wilderness is filled with stirring narrative descriptions punctuated with spectacular photography. After retiring from his teaching career as a professor at The University of Illinois, Wilkins focused his energy on hiking, climbing, and backpacking inside some of the most remote portions of arctic Alaska’s Brooks Range. In addition to using canoes and packrafts, he solo-backpacked throughout the region. He also served as a Volunteer Backcountry Patroller for the National Park Service. Displaying a comprehensive understanding of the harsh realities of the landscape, this book has captured the essence of one of the most beautiful and untouched regions of North America. Readers will be mesmerized by his descriptions of the Aurora Borealis flickering across the nighttime Alaskan skies as well as by Wilkins’ portrayal of the flight of a boreal owl. They will be able to almost smell the fragrant aromas of springtime’s arrival on the tundra, savor the fresh water of mountain lakes, and taste the rich sweetness of the region’s numerous wild berries. Wilkins takes readers deep into a delicate, dangerous and yet quite vulnerable world containing diverse wildlife. He shares his exciting encounters with Dall sheep, rough legged hawks, fighting moose, musk oxen, arctic foxes, and a mother Grizzly bear nursing her cub. He presents his photographs of two charges by Grizzly bears and reports on a “nighttime conversation” he had with a pack of wolves deep in the boreal forest. He describes the geology, wildlife, and forests of the region. His depictions enable the reader to vicariously experience the intimidating weather, mountainous terrain, wild animals, deep-water lakes, and white-water rivers of this magnificent park. For more information or to purchase, please visit http://www.joesalaskabook.com.